Heat the oil in a large pot over medium heat until shimmering. Add the onion and garlic, season with salt and pepper, and cook, stirring occasionally, until softened, about 5 minutes. Add the marinara sauce and meatballs and stir to combine. Simmer, stirring occasionally, until the meatballs are heated through and the sauce is slightly thicker, 12 to 15 minutes. While the meatballs are simmering, spiralize the zucchini. Add the spiralized zucchini and cook, tossing the noodles often in the sauce, until the zucchini just starts to soften, about 5 minutes. (The zoodles will look dry in the beginning, but will eventually release a lot of water that thins out the sauce.) Serve immediately, topped with Parmesan cheese. Frozen meatballs: Frozen meatballs can be used here straight from the freezer. After they're added to the pot, cover and cook 5 minutes extra before uncovering and continuing with the recipe. Make ahead: The zucchini can be spiralized and stored in the refrigerator for up to 2 days before cooking. Storage: Leftovers can be stored in an airtight container in the refrigerator for up to 4 days, but the zucchini noodles will be much softer. In Recipes-list.com we have selected the most viewed recipes from category - uncategorized . Enjoy the best recipes specially selected for you! 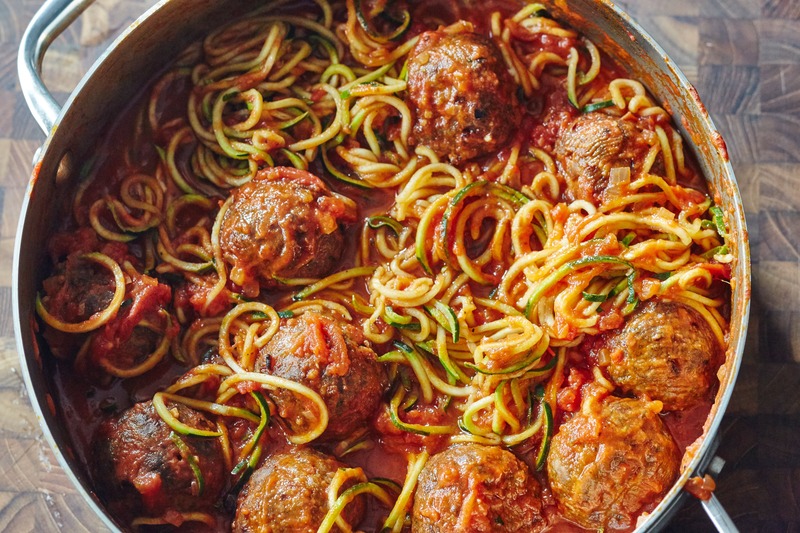 One-Pot 30-Minute Zoodles and Meatballs is the right choice that will satisfy all your claims.